Are you one of those people who spend entirely too much money on groceries every month? You are not alone, as this is a big problem for many people all over the country. Everybody needs to eat, however, though you certainly don't want to spend so much that you blow through your budget and put your finances at risk. Wouldn't it be nice if there were a way to spend less money on groceries without really seeing much of a change on what you have stocked in your refrigerator? This may sound difficult, but the challenge is not nearly as daunting as it appears. Rather than opting for regular supermarkets, seek out those that are known for offering budget prices - some of the most popular options include Aldi and Bottom Dollar Food. You don't have to shop solely at these stores, but you can supplement your grocery shopping by picking up a number of items at a greatly reduced price. Believe it or not, many of these stores have the same brands that you have grown accustomed to. Does this mean that you need to make an extra stop every time you go grocery shopping? It's likely. However, the money that you can save is well worth the effort. In the past, there was a perfectly viable excuse for not clipping coupons: You had to purchase a newspaper in order to find them and realize the savings. But nowadays, this is no longer the case. With the help of the Internet, you can search for and print coupons for just about anything. From food, to personal hygiene items, to pet supplies, and much more, there are endless supplies of coupons online, available for the taking. Don't be shy about printing out as many coupons as you can find. You may not use each and every one on your next shopping trip, but it's nice to have many options at your disposal. Just remember, most coupons have expiration dates, so be sure to use them on time. I never thought this would help me save money until I tried it - and now, I never head to the grocery store on an empty stomach. When I am full, there is a less of a chance that I will make impulse purchases for items I don't need. When I am hungry, anything that looks good ends up in the cart. Give this a try. You may find that it is the best way to spend less money on groceries. Some people ignore the fact that they overspend on groceries, solely because they consider groceries to be an absolute necessity. While this may be true, this doesn't mean you can't save money. There a number of ways to spend less at the supermarket without sacrificing the quality of food you bring home. Having a few extra dollars in your bank account at the end of the month makes it well worth the effort. 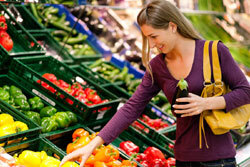 What other ways can you suggest to save money on groceries? My food bills dropped dramatically when I started bringing a list and writing menus. We all knew what was going to be prepared for dinner and there was no impulse shopping. I also spend 10 minutes/week clipping coupons and between them and the loyalty card discounts, I save anywhere from 40-70% on my food bills. All of the planning takes about 20 minutes/week, plus 10 minutes to cut coupons. Totally worth it. Great tips on savings and you might also add; Watch weekly flyers and plan meals around savings. I used to pass 3 chain stores on my way to work I would get the appropiate flyers and always have versatile meals whilst maintaining healthy meals and savings. The way we save money on groceries is to use up what we have & track our food waste! It definitely helps! I know that one of the small grocery shops in my town reduces items at about 6pm, so I often swing by then to see what is there. A larger supermarket near me reduces items at about 8pm, so I sometimes take my dogs for their evening walk to the shop, and they wait outside for me while I go and see what is available. I often get nice bread at ridiculous prices, which I freeze at home. I still refer back to your blog for inspiration when I have frugal fatigue. I haven't used coupons much in the past few years since I usually shop the produce aisle and the bulk section at my local food co-op, but I'm going to give it a try again. Thanks for the good ideas. I buy things that may only have a single use like (so many choices) oh yes, pine nut flour. Well duh. Now I have to store it. I am making headway into using all those impulse buys and NOT BUYING MORE. Thanks for encouraging me!